And here we are, up to Ibis... my most famousest book. I was talking about "fenceposts" in the Ups and Downs of Simpson Snail page, and this surely is one of them. I think sales are approaching, if it hasn't already passed it, the one million mark (that's books sold, not dollars earned!) As of this writing, it's been 28 years, and it's still out there in print. 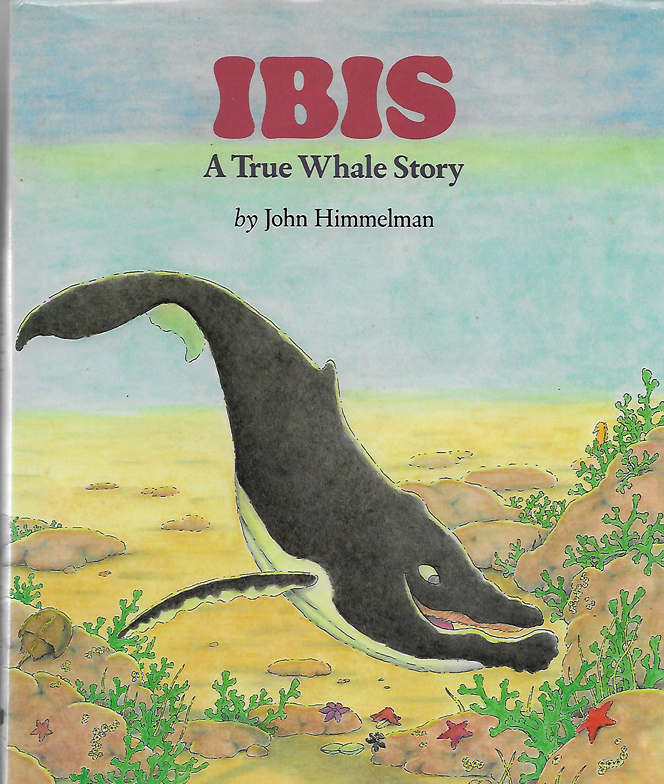 The story is based on a whale I met - Ibis - on a whale watch out of Cape Cod in 1986. 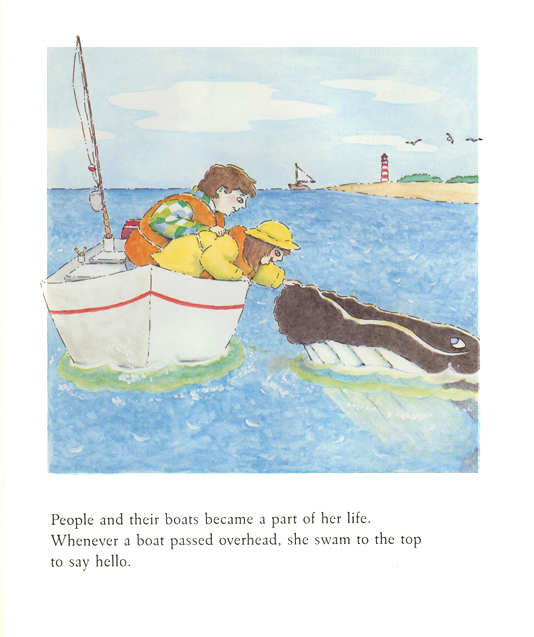 I listened to the story of her rescue from Stormy Mayo (who was one of the rescuers), aboard the Dolphin fleet, all while looking over the railing and into this whale's great big eye. 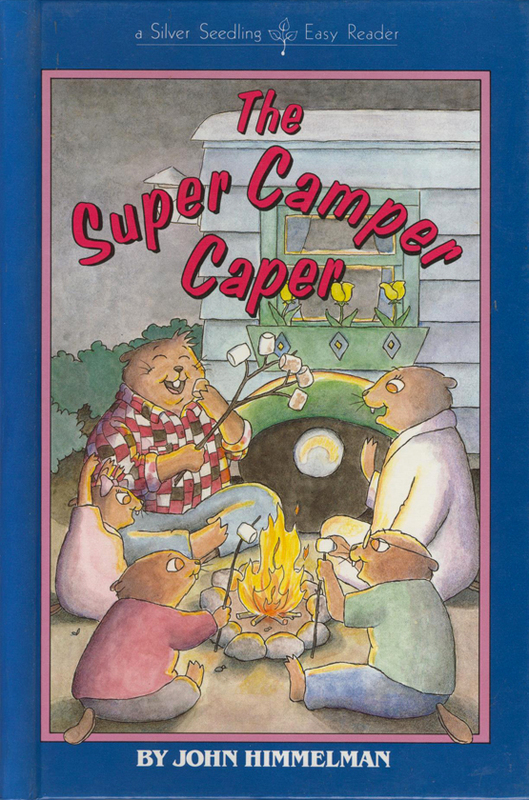 The illustration on the right only appeared in the hardcover version. It was yoinked from the paperbacks because of an error I made. See the eyes of the two humans? This is the only picture in which they're drawn as having an iris and sclera (white-of-eye). In every other picture, human eyes are depicted as black dots. The first time it was pointed out to me, about a year later, was when an art director was looking through my work and commented on this picture, "Interesting how you drew those eyes differently." I didn't know what she was talking about at first, and then she pointed out the other eyes. I did my best to hide the pain of that moment! Nothing could be done at that point - at least until it was reprinted in paperback - and completely deleted. Ibis, the real one and the story one, was caught in a fisherman's gill net. It wrapped around her mouth and tail. 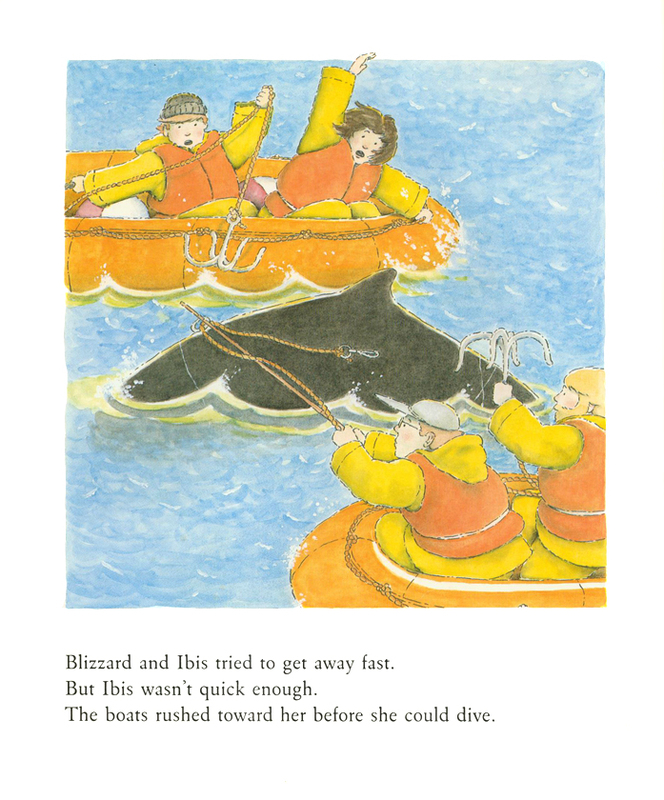 Her friend Blizzard, the real one and the story one, stayed behind with her off of Cape Cod. The netting and bubbles were painted in with white guache over the watercolor. I wanted people to be happy for the silvery fish's escape. They're an actual Atlantic fish, but I forget what kind. It almost felt wrong doing that - providing some light-heartedness in such a heavy scene. But I thought it helped stir the emotions a bit. See what I was talking about with those eyes? The rescuers are based on pictures I found of the actual people. Stormy Mayo, who told the story aboard the ship, is the one up front with the long-brimmed hat. After trying to smooth out my watercolors for so long, I threw that idea out the window for this book and loosened up for the water. Since so many of the illustrations would be of the sea, I really needed to get my sea-painting-game on. Adding the white spray with guache was a new thing I tried, and I think it worked okay. This was a big moment and really happened. Ibis was panicking during the rescue attempt. Then one of rescuers stuck his hand in the water. 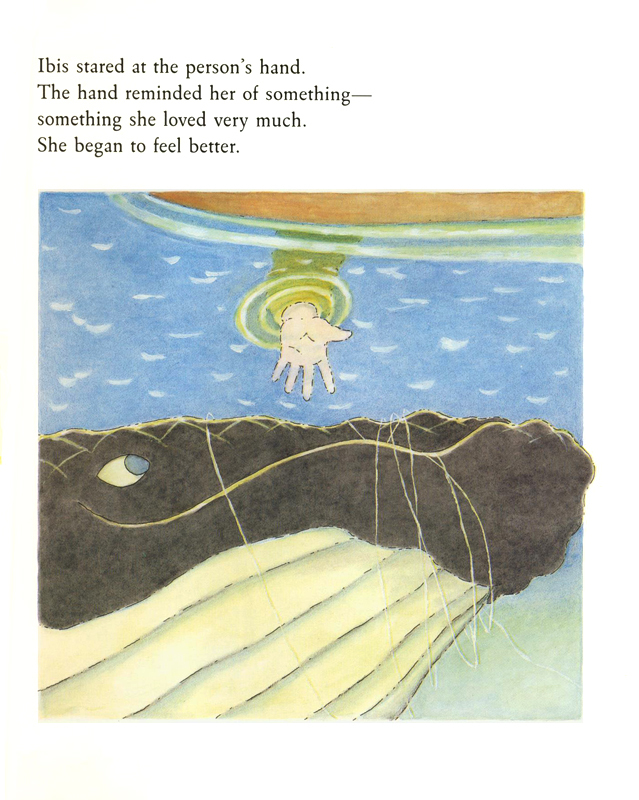 The whale looked at it and calmed down. Of course we don't know exactly why it worked, but as this was a picturebook, and the story comes first, I needed to come up with a reason because this HAD to be in there! I remember staring at my hand, imagining seeing it as a whale. What was it about that hand? And then... starfish. It looks a bit like a starfish (sea star, now). 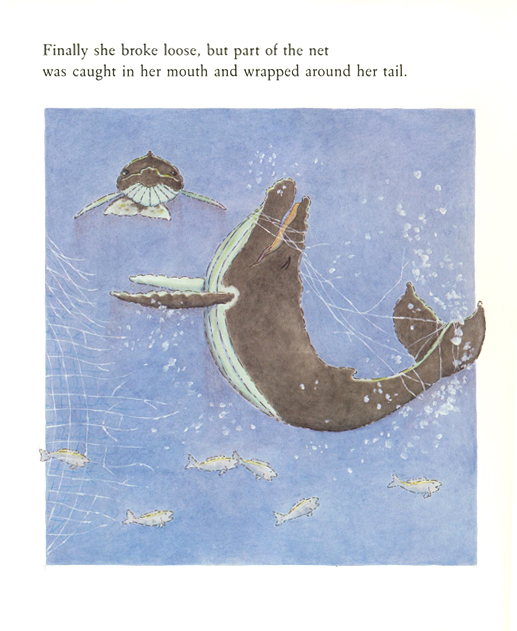 So, in the beginning of the story, I showed how Ibis loved watching starfish as a young calf. Later, when she saw the hand, it reminded her of something - something she loved very much. Oh, and listen to this! Singer/songwriter Steve Schuch wrote a song about the story! It's on his Trees of Life album.